Shiny foil, rookies galore, bountiful autographs and massive memorabilia card checklists collide in 2011 Panini Totally Certified Football. 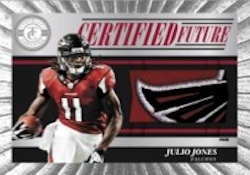 Carrying the signature foil look that has been a mainstay with the brand since it debuted in the late 1990s, 2011 Panini Totally Certified Football is a hit-per-pack product that promises one autographed Freshman Fabrics rookie card in every six-pack box. Collectors can also expect a strong mix of retired greats on both the autograph and memorabilia card checklists. 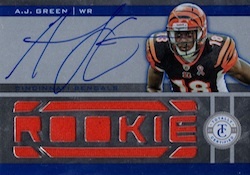 Panini HRX video cards make their first football appearance, promising several minutes of original content. 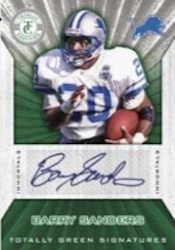 2011 Panini Totally Certified Football comes with a 236-card set: 100 base cards, 50 Immortals highlighting the game's greats, 50 Freshman Phenoms rookie cards and 36 autographed Freshman Fabrics. Autographed Freshman Fabrics have on-card autographs and are numbered to 499 or less. 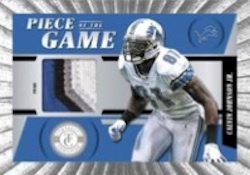 Panini HRX video cards make their gridiron debut. Each digital card will include a generous amount of exclusive video footage. The checklist includes Cam Newton, Mark Ingram and Andy Dalton. Collectors can also hunt for Autographed and one-of-one Autographed Gold versions. Stitches in Time (/249) include swatches from four different players. Prime patch versions are limited to 49 copies. Heritage Collection (64 cards) focuses on retired greats. Piece of the Game carries a large checklist of 75 players. Immortals (50 cards) give collectors an opportunity to chase football's legends. 2011 Totally Certified Factory Sealed FB Hobby Box Cam Newton AUTO ROOKIE ??? 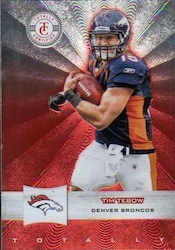 2011 Panini Totally Certified Football Hobby Box! Loaded with Star RC's! Nice! 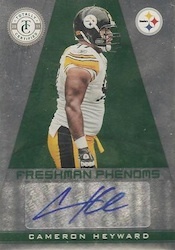 Good looking cards but Panini seems to be putting a lot of redemptions in their products. Good selection of Heritage players. Agree. They have far and away more redemptions then any other companies. But according to what Panini’s top brass said at the Industry SUmmit a few weeks ago. Let’s keep our fingers crossed!